In round three, the pace remained brisk as there were two more decisive games. Only Kayden Troff and Jeffery Xiong remain undefeated in a first place battle. 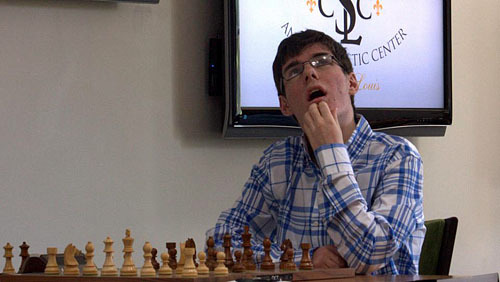 Samuel Sevian got his first win after facing Michael Bodek’s improbable 1.Nf3 e6 2.g3 g5!!?? FM Michael Bodek seem to have gotten his inspiration from outer space… 1.Nf3 e6 2.g3 g5!!?? Ultimately, Bodek’s plan backfired as his kingside became predictably weak and pieces started to encroach. Both players ended up in time pressure on a 30-second increment and there were several blunders made. However, Bodek decided to play for more than a drawn nursing a pawn advantage, but his king exposed in the open board. Sevian kept probing black’s position with his queen until black’s position came crashing down after his lost his queen. The win is a sigh of relief for Sevian who had lost his first two games. Josh Colas played his friend Aleks Ostrovskiy and continues trotting out the London system to sidestep preparation. Predictably, this will not get white much in the way of advantage. In fact, black had developed a slight advantage before the game petered out into sterile equality. Both are on an even score after three rounds. 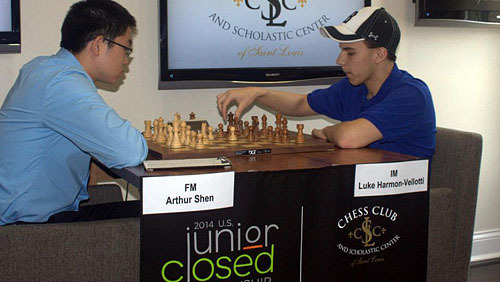 The tournament’s longest game occurred between Matt Larson and Jeffery Xiong. Despite the nearly 300-point rating difference, the hometown favorite battled valiantly throughout. The game started as a highly theoertical Grunfeld that Xiong played rather well. Black reached totally equality by move 30, but Xiong was playing the rating game and pressed on. However, black played an ambitious 35…h5!? However, Larson was in a desperate time pressure with seconds hanging and missed that white would win instantly by 40.Rd5! White actually lost a pawn held a 3 vs. 2 rook ending rather easily. It was “Fire on Board” between FM Arthur Shen and Luke Harmon-Vellotti! Shen-Harmon-Vellotti was a French Tarrasch where white got an overwhelming attacking position. However, it would be 22.Bf6!? that would force black to donate an exchange. White’s attack was still very strong. aFter 24. g4 Ne7 white missed 25.Bxe7! Rxe7 and 26.g5. Instead he played 25. g5 Neg6 26. Kh1 Qf4 27. Bxg7 Kxg7 28. gxh6+ Kh8 and now black’s shredded kingside was repaired! The key was that despite the black king scampering for safety, white’s king was in sudden danger. White had to return the exchange, but black now had a winning ending and was duly converted when the white king was cut off from stopping black’s passed pawns. Justus Williams played his usual 1.Nf3 but faced an unorthodox response from top-seed Kayden Troff. Black understood the position and got a strong position after move 22…Rfc8, but in a few moves white was OK. A three-fold repetition ended the game. Each round of the 2014 U.S. Junior Closed will see its first move daily at 1:00 p.m. CT through June 29, with a rest day on Wednesday. The tournament will be streamed live on www.uschesschamps.com, with commentary, analysis and player interviews by GM Ben Finegold and FM Aviv Friedman.